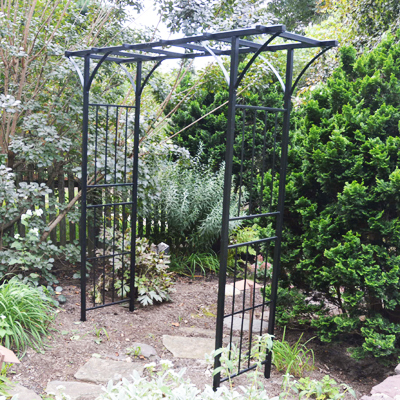 Generously proportioned, all-steel Archway has an overlapping flat top. Big enough and strong enough to support muscular climbers, like wisteria, trumpet vines and climbing roses. Lots of head room and width for pathways and mowers. 5 ft. wide x 7 ft. tall x 20" front to back. Flat lattice top is 7 ft. wide x 2 ft. across. Four ground anchors provided for each corner. Assembly is required. Weight: 84 Lbs. Classic Monet Pergola Extendable as long as you like! Pergola means a shaded arbor through which you can walk. Imagine it covered with grape vines, roses, wisteria, or clematis. Make a luxuriant feature in your veggie Potager covered in cucumbers, gourds, and climbing nasturtiums. 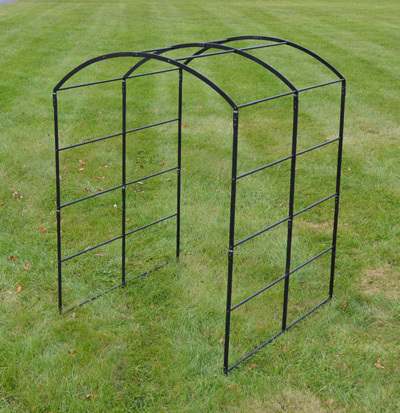 Our basic Pergola has three hoops as shown: 5 ft long x 5 ft wide x 7 ft tall. Each extension adds 30" to the Pergola's length. (Sold Separately) All steel construction, powder coated black. Assembly required. Weighs approximately 34 lbs. Classic Monet Pergola Extension Kit Extendable as long as you like Pergola means a shaded arbor through which you can walk. Imagine it covered with grape vines, roses, wisteria, or clematis. Make a luxuriant feature in your veggie Potager covered in cucumbers, gourds, and climbing nasturtiums. Each extension adds 30" to the Basic Pergola's length. All steel construction, powder coated black. Assembly required.